If you want to import picture logs for your picture files, ensure that they are correctly formattedYou can import log entries formatted in Word (.doc, .docx), rich text (.rtf), or plain text (.txt) into picture sources. A line in a text file or a paragraph in a document file will be imported as one log row.. If you want to create case nodes for your picture files as you import them. 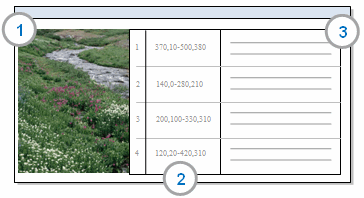 Annotate the picture or regions of the picture directly or annotate text in the Content column of the log. Create 'see also' links from the picture, regions of the picture or the log.